Emmeline Illustration: A new wave of inspiration. A new wave of inspiration. Good Morning sweetpeas and dandelions! I hope you're all enjoying our imminent lull into Autumn. You might have noticed I've had a bit of a switcheroo with the blog with a new title and more open lay out. I think maybe I was a little inspired by Blogger's overhaul and fancied a change myself! With all the commotion of the print auction now over (official amount we've raised to be announced, it's a good old pile though!) and a trip down to the rugged Cornwall coastline to be with my family; I've been getting back into some intense illustrating. This lovely lady is Chang'e who I was inspired to draw by The Chinese Moon Festival (or Mid-Autumn Festival) at the start of this week. The legend of Chang'e and the Moon is quite a sad tale as most legends always seem to be. The legend goes that Chang'e was married to the courageous Hou Yi who, amongst other things, saved the world by shooting down (with his perfect archery skills) nine of the ten suns around the earth. The Queen Mother of the West gave him an elixir of immortality as a reward for his heroic undertaking but warned him not to drink it without preparing with a prayer and fasting for a year. Whilst Hou Yi was out one day doing something adventurous his sneaky apprentice Peng Meng found out about the elixir and forced Chang'e to give it to him. 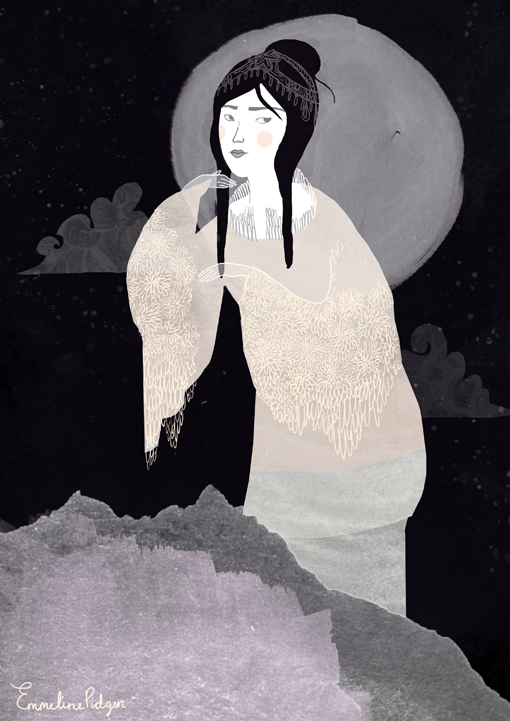 Knowing she could not defeat Peng Meng, Chang'e swallowed the elixir and suddenly felt herself floating up to the moon. With deep love to her husband, Chang'e chose to be an immortal on the moon, closest to the earth; so she could see her husband every day. Obviously everyone was very upset about this, but word spread and people put out offerings of her favourite food for Chang'e on tables under the night sky, to pray for her good fortune and safety. This has become one of my favourite illustrations of late, I love drawing mystical mountains and lovely, slightly melancholic ladies. On a more cheerful note! 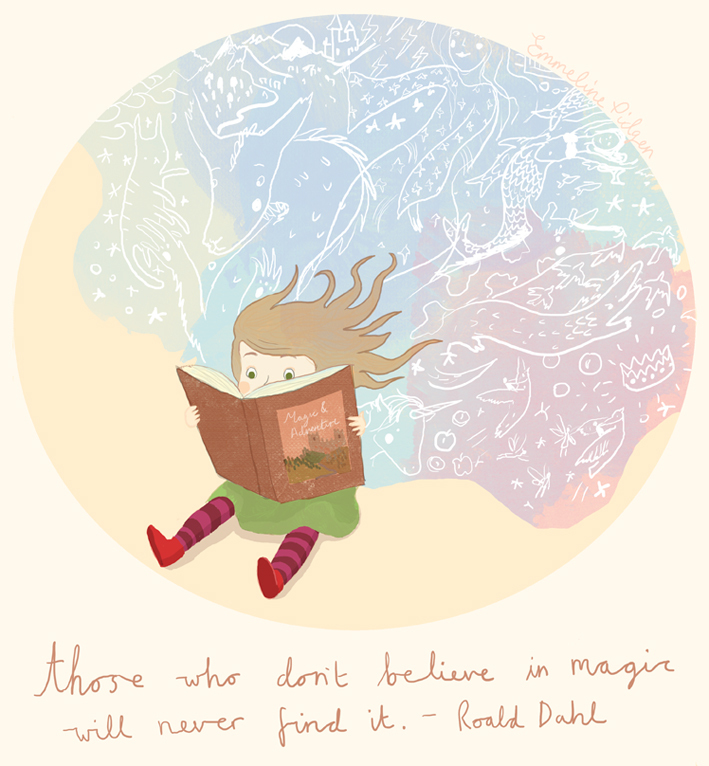 A few days ago it was Roald Dahl day! I know the majority of us will have spent countless hours in our childhood (and beyond!) making friends and being scared by the dynamic and captivating characters he created. There's nothing like one of his worlds. I like to imagine this little girl is the sister of the 'Tales of Adventure' boy. I've been in a very magical mood recently as I've been reading The Hobbit! After spending four days in Middle Earth I feel ready for an adventure. I have an appointment next Tuesday to go and fight a dragon, so remind me to skip on the hairspray that morning. Now go! Go and have a beautiful day in whatever part of the world you're in. Lovely illustrations Emmeline! By the way, I still haven't sent you my letter, but I will when my hectic life has calmed down a bit. These illustrations are perfect. What a sad story about Chang'e!